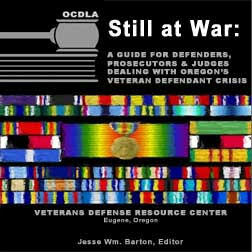 Still at War: A guide for defenders, prosecutors & judges dealing with Oregon’s veteran defendant crisis. 1) Did you even know it? 2) Did you defend the client any differently as a result? Still at War is a cutting-edge publication for OCDLA. Featuring the collaborative efforts of skilled defense attorneys and experts in veterans defense, as well as contributions from an experienced investigator, prosecutor, and Veteran’s Treatment Court judge, the information in this book will not only save you many hours of chasing down foxholes in search of authoritative answers, it will make you a better lawyer. The low price point—far below the fair value of this book—is a discount designed to maximize use of this vital information for effective handling of cases involving veteran defendants.